When I first started practicing yoga in Berkeley, I wore contact lenses all the time. Then a friend commented that wearing contacts permanently enlarges blood vessels in the eye. “Look at people who’ve never worn contacts,” he said. “The whites of their eyes are much whiter.” He was right. So my original vanity to avoid being a “girl in glasses” bowed to my wiser vanity to maintain clear, bright eyes for the rest of my life. I experimented with wearing glasses during physical activity: Working out at the gym (fine). Running (troublesome). Swimming using Rx goggles (surprisingly fine). Yoga (fine). I tried all poses, including inverted ones from Adho Mukha Vrksasana (Handstand) to Sirsasana (Headstand), without complaint—and, believe me, I’m not one not to complain. Never did they move excessively, much less fly off my face. I removed them only for Savasana. When I moved to Vancouver, I was surprised when a senior teacher directed me to remove my glasses in Sirsasana. I complied, but was unconvinced of a rationale. Most teachers didn’t insist on glasses removal for Sirsasana, so I continued to wear them for all active poses. Recently the issue arose in a teachers’ discussion on students who refuse to remove their glasses. I can somewhat understand the preference for no glasses during Savasana and Pranayama, both which are practiced with closed eyes. But I’ve yet to buy into the removal of glasses for other asana. Is it a safety issue? Could students fall and smash their specs doing Sirsasana? Impossible, as one would topple over onto one’s back, not one’s face. What about Sarvangasana? I see no way that glasses are even remotely in harm’s way. The only potentially risky poses are arm balances such as Bakasana. But if a student has no qualms about wearing glasses, why force removal? Some suggest that the mere act of wearing something on one’s face (ie, glasses) creates an uncomfortable, distracting impediment. Well, as a glasses wearer, I can vouch for the lack of impediment if wearing well-crafted, well-fitted glasses. I love my Danish Lindberg frames (my collection pictured here). 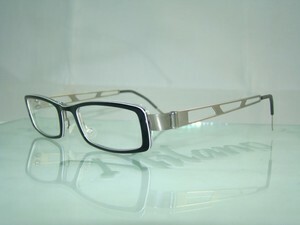 Made of titanium and acetate, light as a feather, they fit perfectly. Maybe I’d wear contacts if I did a sweatier form of yoga. But, for the precision required in Iyengar yoga, I must accurately see the teacher’s form and alignment. Besides, if glasses are considered impediments, what about bangle bracelets (that jinglejangle), dangling earrings (lying in wait to rip an earlobe), rings (ouch! ), a necklace that falls in your face when you’re upside down, and watches (hampering your wrist and wandering your mind)? We are all visual balancers, which I blogged about in Blind balance, so I’m all for improving our vestibular system and other balance mechanisms. But for class consistency, all students must be either fully sighted (wearing corrective lenses if needed) or fully blind (with eyes closed). Anyone care to convince me otherwise? I don’t know that this will convince you otherwise, but here’s my experience as someone with a modest impairment of distance vision. As a relatively new wearer of glasses, I find them massively distracting in the poses (what’s this on my face??). I’d rather not wear them even for basic standing poses. But, like you, I want to see the details in demonstrations. So I keep them beside me in the room, put them somewhere safe while I’m in a pose, and put them back on again to see the demonstrations. I do wear my glasses for teaching – I want to see the details there too. Apart from Savasana and Pranayama, I have no problem with students wearing glasses. I’d hate to be told that I have to keep my glasses clamped to my face in class – although I’m grateful to have them and wear them while I’m driving. I think a lot depends on the degree of vision impairment, and on the amount of time you’ve spent wearing glasses. The answer is probably about as varied as the students. Oh, and I do take my wedding ring off for Sirsasana. Ouch, indeed. I’ve worn glasses since I was in 7th grade… so going on oh, 30+ years now. And I have worn glasses since I started practicing yoga 10 years ago. I wear them from start to finish, during Savasana and pranayama. I primarily do Ashtanga and vinyasa classes. I have never had an instructor tell me to remove them. I have never had a problem – other than *one* hot yoga class where I did sweat excessively. My personal issue – I have an astigmatism and one eye is significantly stronger (or weaker) than the other so there are depth perception issues. To leave my glasses off while moving can make me nauseous. Tossing my cookies in class just doesn’t seem like a fun thing to do. My concern with taking my glasses off during Savasana is the instructor stepping on them. So I either put them on my stomach where now I’m concerned that *I’ll* squish them, or I hold them in my hand which feels just wrong. To leave them on my face is best. For me, it is no different than any other piece of clothing I wear. Same for pranyama. I can do my breathing exercises with my eyes closed AND my glasses on my face just fine. It has never been an impediment in my ability to focus. Sirasana – again, it’s a depth perception thing. I actually have to put my water bottle at the end of my mat as a focal point. And I’ve fallen over. Haven’t squished the glasses yet! Agreed on the rest of the jewelery: bangles, rings, watches, long earing, necklaces. My rings come off before I even go into the studio. I couldn’t imagine wearing stuff that slides up and down and up and down my wrists for an hour and a half. Ugh. Most of the time I see people stopping to pull off their jewelry anyway, so why not just take it off before? I used to wear glasses up till two years ago when I got Lasik done and am glasses free ever since. My experience with Lasik has been fantastic. I don’t think I had issues with doing yoga wearing glasses, but not having to fiddle around in the morning looking for them and not worrying about rain drops hindering my vision is very nice and enjoyable. I agree with you in that it is more important for me to clearly see and understand the directions than worrying about looks. Well written and I thoroughly enjoyed it. Very interesting post. I’ve been wearing glasses since I was 6, so for about 24 years, and have been practicing yoga for at 12 years. I prefer to leave my glasses on as well. I sometimes take them off during inversions, but usually I leave them on all the time (except for savasana). I’m not sure how I’d react if asked to remove them; without glasses or contacts I can see less than a foot ahead. I think, even if sight weren’t necessary for the pose, I would feel disconcerted and off balance. I agree with you 100%. Only someone without a vision impairment would ask that of you. What about hearing aid devices? Would you ask someone to remove the external portion of their cochlear implant for safety reasons? What about their hearing aid? It all comes down to not understanding what it means to have to devote extra energy for one of our senses. I know that even in classes where the acoustics are poor, or the classroom is echo-y, or the fan is loud, or the music is loud, that with my hearing loss (not needing aid yet, but there) I have a difficult time focusing on the class, as much of my energy is going into simply hearing the instructor. I’ve been wearing glasses for 25+ years and my vision without them is pretty poor. First thing I do when I wake up in the morning is put on my glasses. It’s incredibly disorienting for me to not wear glasses and to ask me to remove them would make me very uncomfortable. I wouldn’t be able to focus on anything going on. My glasses fit well and don’t get in my way. I wear them for even the sweatiest, most active exercise without any issue. The only time I wish I did not wear glasses is in the rain. I am happy I have never been asked to remove them in a yoga class. I too taught and took yoga. Was always flinging off my glasses as I get sweaty in that nose area. I had lasik eye surgery in 2004. Happy camper here. Plus one eye extremely different in vision than the other. Distance vision is great now……now, only if I didn’t need my readers for looking up vinyasas in class! LOL! I am wearing glasses 40 years now. During yoga classes (Vinyasa flow/ Ashtanga) i wear them and they don’t distract me at all. On the contrary – extremely shortsighted i really need them. Only in shavasanah i put them aside. 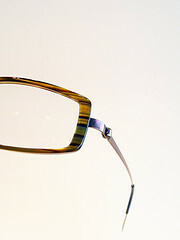 Btw i wear Lindberg frames – like YogaSpy said light as a feather and just comfortable–although expensive. But they just last. Pingback: ybicoalition.com – Black Yogi. White Studio. Namaste! I am currently updating the user-manual for my home study course that I have created on Yoga-dance and one of my DON’T is to remove glasses during personal Yoga practice. I chanced upon this article and am inspired to write my thoughts. (1) Ideally, as is practiced in India, when you learn from a teacher the basics, then you practice poses or Praanaayaama on your own, with the eyes closed. Eyes are the most distracting of all sense organs. So closing the eyes cuts off much of distraction. Traditionally in India, the classes are NOT like the modern day “copy-the-instructor” kind of classes. (2) Trying to see without wearing glasses at least for some time improves vision. This is one of the steps used in naturally curing vision problems. Constantly wearing glasses increases vision problem. So, when there is no need to see anything clearly, why wear it? Just use your natural eye power. (3) I teach in the USA (www.yogaforhappiness.com) and I encourage students to put on glasses and watch me when I demonstrate, and then put the glasses off in a specially supplied box and keep it next to them. The glasses will not break and they can focus on their pose with the eyes closed. (4) The same logic is used in Classical Indian dancing, too. Sorry! In my earlier comment, I actually meant that one of the DOs is to remove glasses during personal Yoga practice. Not wearing your glasses actually makes your eyes get worse faster, not the other way around. Please don’t spread fictions around, this is how people end up coming to believe ridiculous things like this, from people repeating it place to place without having any actual expertise in the area. “Then a friend commented that wearing contacts permanently enlarges blood vessels in the eye.” Hi. This is not true at all, and while you are of course welcome to post anecdotal comments on your blog as fact, I find it distressingly irresponsible of you to perpetuate this misinformation without doing the research. Improperly worn, handled or prescribed contacts can cause scar tissue to build up in some cases. But this “all people who wear contacts have yucky dull eyes” idea is just drivel. I wear my glasses for every single sport I do. I also wear prescription sports sunglasses for running, biking, hiking….. I do keep them on during yoga classes in order to see the instructions/demonstrations. They are held on securely with an elastic and I do not feel them at all. Even keep them during Savasana as they are so part of me and not bothering me. I did find this blog though as I had an incident last week. While in Bakasana, I lost balance lightly and gently fell forward, not a major fall at all but my glasses remained in place, acted as a knife and cut a deep slice of skin from my nose requiring 8 stitches. It has been 5 days. I have not been to a class yet. In the future, I will try to do without them and if not possible, will wear them for the demo then remove them but I feel that will be distracting. I cannot tolerate contacts at all. I felt I needed to share my experience to raise awareness this ”danger” of wearing eyeglasses during yoga practice. Previous Previous post: Proust had his madeleine, what about you?